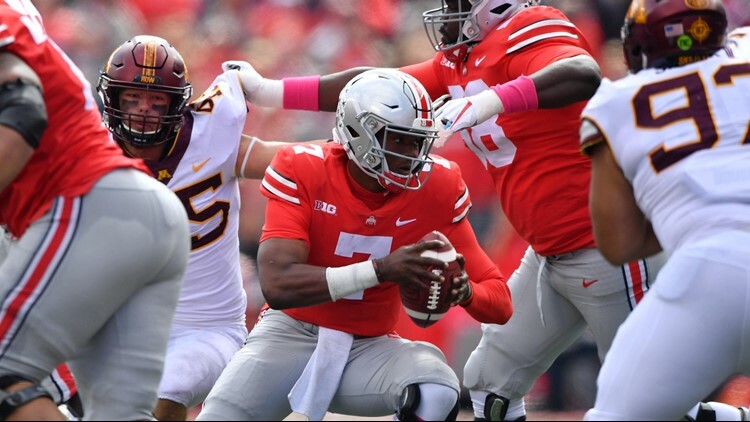 Quarterback Dwayne Haskins #7 of the Ohio State Buckeyes is chased out of the pocket in the third quarter against the Minnesota Gophers at Ohio Stadium on October 13, 2018 in Columbus, Ohio. Ohio State defeated Minnesota 30-14. Dwayne Haskins threw for 412 yards and three touchdowns. COLUMBUS (AP) - Dwayne Haskins threw for 412 yards and three touchdowns as No. 3 Ohio State held off persistent Minnesota to win 30-14 Saturday in a game where little went well for the Buckeyes beyond their passing game.